The model of the proposed aquatic park for Paynesville, created by PAHS science students, will be on display at two public informational meetings this week. The pool committee and their consultant (USAquatics) will host public meetings on Thursday, Feb. 26, at 7:30 p.m. and Sunday, Feb. 29, at 2 p.m. in the school auditorium. 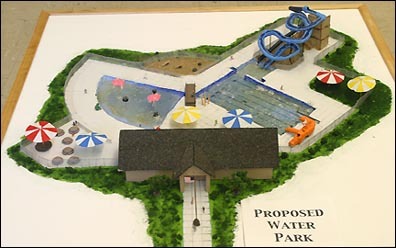 City and township residents will vote on the proposed aquatic park on Tuesday, April 20. Students at PAHS bult this model of the proposed aquatic park - using a scale of 1" to 8' - in five day. They used everyday things like spaghetti, screen, pins, clay, and styrofoam to make the model. Pictured, clockwise from lower left, are members of the combined physics and principals of technology class at PAHS: Jon Younkin, Jason Albright, Marlowe Schaumann, Derek Burris, teacher Jay Thompson, Bobby O'Fallon, Jessie Virant, Scott Millner, and Jon Scheierl.